Farm buildings made by Britespan Building Systems are a bright and comfortable environment for livestock and also a bright and open storage space for your equipment. Visit the fabric building image gallery here to see lots of Britespan coverall buildings. 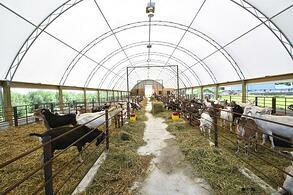 create a comfortable and healthy environment for livestock. 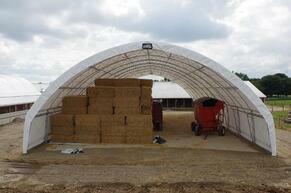 Protect valuable hay by housing it in a Britespan fabric building. 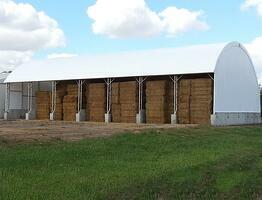 A hay storage fabric building will help decrease the amount of any spoiled hay, commodity or grain and preserve the feeds nutritional and sale value. 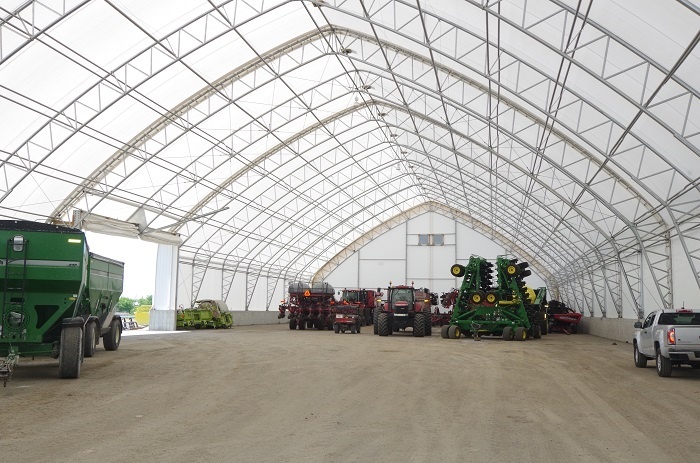 The exceptional height and clear span design of our fabric buildings have no interior columns, allowing for easy access to your crop and convenient handling by farm machinery. 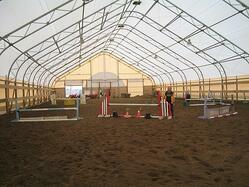 A fabric building is the perfect solution for efficient equipment storage. No interior columns allow for easy of maneuverability within the structure. While protecting your investments from the damaging effects of snow, rain, and UV rays that can cause ceased parts, rust, and increased wear-and-tear, Britespan fabric buildings improve the longevity of your vehicles and equipment and reduce maintenance costs. The superior ventilation and air quality eliminates moisture, reducing rust. The fabric covers also allow for bright natural light, creating a safe working environment for crews working inside the building. Our fabric structures are economical building solutions that are constructed in a fraction of the time compared to a conventional building. Unlike conventional buildings, for example, where the outer covering is often punctured thousands of times to attach the roofing and wall cladding, our fabric buildings are much more airtight reducing air and heat loss. The translucent properties of Britespan’s fabric covers allow natural daylight into the building, reducing or eliminating daytime lighting costs. 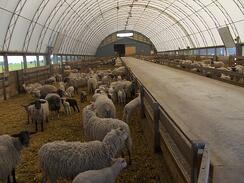 Sheep barns not only offer comfort for the sheep, but for the shepherd as well. It is easier and much more enjoyable to care for sheep that are housed. Our fabric structures are the ideal building solution for your sheep and goat operations, with superior ventilation and air quality. The clear span design and light fabric covers allow for bright natural light and air circulation and movement, decreasing the risk of disease and mortality in your herd. In comparison to traditional dark, wood or steel buildings, the natural daylight and superior air quality and ventilation of Britespan fabric structures have been proven to assist in a reduction of moisture and bacteria which means a healthier, fresher, cleaner and drier environment. Ventilation management options include roll-up sides and ridge ventilation. 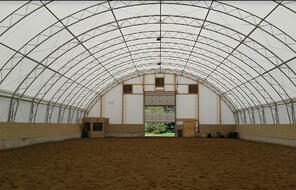 Clear span fabric buildings offer a superior option to traditional buildings. 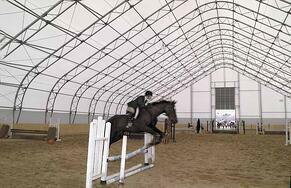 With a riding arena from Britespan, you can ride and train year round, regardless of weather condition. With superior height and clearance compared to traditional metal or wood buildings, our structures allow you to utilize as much space as possible. With the sound-absorbing quality of the fabric covers, outside noises are reduced and there is no indoor echoing, providing a peaceful, stress-free environment for riders and horses. These same great qualities make Britespan fabric buildings the ideal solution for boarding, stables and stalls and run-ins. Britespan has designed and engineered custom fabric buildings for every industry, from custom widths, heights, foundations, entrances and openings and more. Because we have the hands on experience engineering these unique structures, you can have the confidence that your Britespan building will exceed expectations. This experience is an asset to those that require something a little more custom than our standard product line. Ask us about all your building options.